"Ukraine is being turned into a mafia state due to the big economic interests of the oligarchs," Saakashvili said, speaking to Austria's Die Presse newspaper. "70% of the economy belongs to seven oligarchs, the most important among them being [Ukrainian President] Petro Poroshenko and Rinat Akhmetov, who together account for about half of this figure. 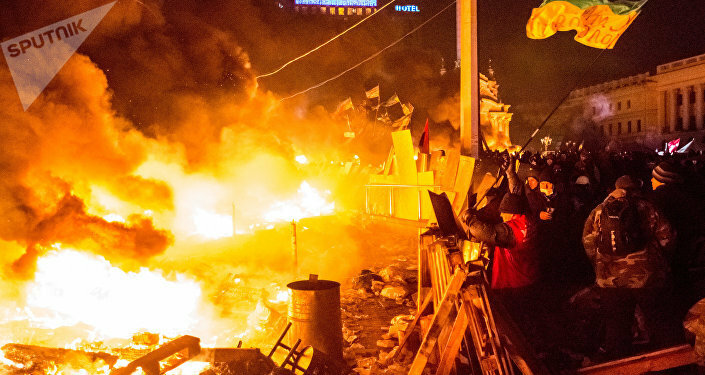 Ukraine's institutions are very weak, and the state practically does not work. Paramilitary forces operate in the country and are used by Poroshenko. Similar forces are subordinated to the Minister of Internal Affairs [Arsen Avakov] and Akhmetov," the politician added. Saakashvili warned that the continued economic degradation of Ukraine's industrial eastern and southern regions, the flow of people out of the country, separatist sentiments, including in western Ukraine's Zakarpattia region, corruption, as well as "Russian military pressure," threaten the country with total ruin. "This threatens a collapse, and then Ukraine will be the next failed state," he said. The politician complained that even under the government of Viktor Yanukovych, who was overthrown in the Maidan coup d'état in 2014, the system of state administration at least functioned. Now, he said, everything is in a state of breakdown. "The old system was destroyed, but nobody created a new one. That is very dangerous," he stressed. Saakashvili, a stateless person and fugitive from his home country of Georgia, where he is wanted on numerous criminal charges, was deported to Poland on Monday. On Wednesday, he received an identity card in the Netherlands, giving him the right to live and work in the EU. The politician came to Ukraine in 2015 at Poroshenko's request and was put in charge of the region of Odessa. A year later, he was out of a job, and accusing the Ukrainian government of enabling and engaging in corruption. Stripped of his Ukrainian citizenship last August, Saakashvili has been on a quest to remove the current government from office.